Potosi/Cassville linebackers Cyrus Siegert (55) and Ben Udelhofen (4) collide with a pair of Benton/Scales Mound Zephyrs in the Chieftains’ 52–6 season-opening victory Friday night. POSTED August 24, 2018 3:51 p.m.
BENTON — With 31 letterwinners returning from last year’s 9–3 team that advanced to Level 3 of the WIAA playoffs, expectations for this year’s Potosi/Cassville football squad are pretty high. The Chieftains opened up the 2018 season on the road last Friday night with a convincing 52–6 victory over host Benton/Scales Mound, but you won’t find head coach Mark Siegert pounding his chest and getting overly excited just yet. “We have so much to work on,” said Siegert. “It was a good game in terms of putting a lot of things on film and showing us all the things we need to shore up. Because there were a lot of miscues, a lot of penalties and just things that you would expect in the first game. Evan as a stickler for the details, coach Siegert is happy to start the season off with a conference win, which is something Pecatonica/Argyle, Black Hawk and River Ridge all did as well. “Obviously it’s good to get a win the first time out,” said Siegert. “You work all off-season and you have a lot of build-up for the season to get started, and I think it’s important that you get that first win. As Benton/Scales Mound found out last Friday night, and everyone else in the Six Rivers Conference will find out soon enough, Siegert has a lot of weapons at his disposal this season, and it starts offensively with three-year starting quarterback Will Bierman. Bierman accounted for 271 yards of total offense and four touchdowns. Through the air, he completed 9-of-12 passing attempts for 259 yards and three TDs, while on the ground rushed four times for 12 yards, including a 17-yard scramble early in the second quarter. The senior QB first connected with junior wingback Ben Udelhofen on a 13-yard TD pass on the team’s first offensive possession. He later added a 7-yard TD pass to senior tight end Mason Infield late in the second quarter, and a 90-yard TD strike to senior split end Brady Curtis late in the third. 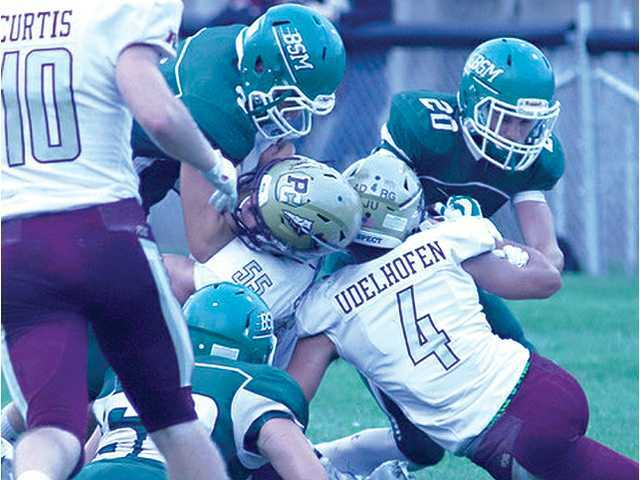 Senior running back Ty Bausch was Bierman’s favorite target, as the speedster had four receptions for 100 yards to go along with 90 yards rushing on 12 carries, including a seven-yard TD run late in the second quarter. Curtis had the one catch for a 90-yard score, while Infield had two receptions for 32 yards and one touchdown. Leading the ground game for Potosi/Cassville was senior Colin Esser, who on 10 carries collected 116 yards, including scores of 18 and seven yards in the third quarter. Junior Jeffrey Jacobson added the team’s final TD in the fourth quarter on a 20-yard run. In all, the Chieftains ran for 277 yards and three scores on 39 attempts, and combined with their 259 yard passing, had 536 yards of total offense. After one quarter of play though, the two teams were knotted at 6–6 after Benton/Scales Mound took advantage of a short field. When a Potosi/Cassville punt bounced off the back of a blocking lineman, Benton/Scales Mound took over at their opponent’s 27-yard line. The Chieftains helped them out even further with a 15-yard penalty that set up a three-yard TD run by Nick Jansen with 3:12 to play in the first quarter. From that point on though, coach Siegert’s squad scored 46 unanswered points in the final three quarters, scoring on every offensive possession in the second and third quarters. Leading the Potosi/Cassville defense with 13 total tackles was senior linebacker Cyrus Siegert, while junior linebacker Ben Udelhofen had eight and senior defensive end Ethan Groom seven. Bierman led the team with two interceptions from his cornerback position, while Jayson Carbone (DE), Trevor Pluemer (LB), Brandon Klein (LB), Sam Ihm (DL) and Austin Uppena (DL) each had one sack in the contest. This Friday night the Chieftains should face a stiffer challenge when the defending conference champions from Black Hawk pay a visit. The Warriors are coming off a 56–6 pounding of Southwestern. First downs — P/C 18, B/SM 7. Rushing – P/C 39-277, B/SM n/a. Passing (comp-att-int, yards) — P/C 9-12-0, 259, B/SM 5-15-1, 47. Fumbles-lost – P/C 0-0, B/SM 1-1. Penalties-yards — P/C 8-65, B/SM 5-46. Rushing — P/C: Colin Esser 10-116, Ty Baush 12-90; B/SM: . Passing — P/C: Will Bierman 9-12-0, 259; B/SM: Wyatt Bastian 5-15-1, 47. Receiving — P/C: Bausch 4-100, Curtis 1-20, Mason Infield 2-32; B/SM: Will Lawrence 2-23. Tackles — P/C: Cyrus Siegert 13, Ben Udelhofen 8, Ethan Groom 7.